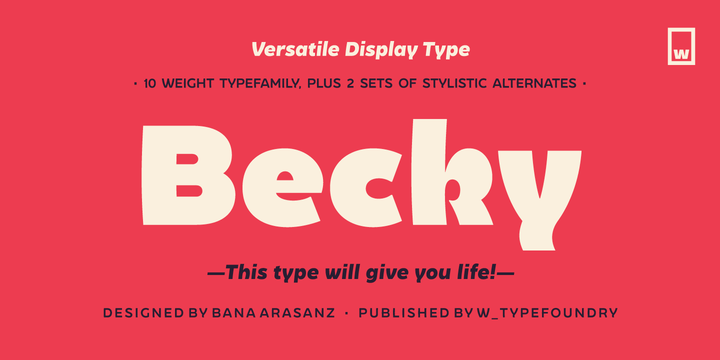 Becky is a sans serif typeface created by Bana Arasanz and published by W Foundry. Based in Santiago de Chile, latin America, it comes in 5 weights (from Light to ExtraBold) whith accompanying italics, 2 alternative stylestic sets and a wide range of OpenType features. It is characterized by ascender height, ink traps, sharp curves, curvy diagonals and wavy waves. This versatile font is suitable for editorial purpose, branding, packaging etc. Have fun! Price: starting from $22,00 for one font to $149,00 to all 10 fonts. A font description published on Tuesday, January 10th, 2017 in Bana Arasanz, Fonts, W Foundry by Alexandra that has 2,426 views.